Make immediate improvements from just one 3-hour session! This overview introduces 10 types of design and delivery dilemmas, and corresponding remedies. These dilemmas and remedies apply to any presentations you create with slide software, such as Microsoft® PowerPoint® or Apple® Keynote®. Rather than “how-to” training on using these programs, this potent overview focuses on scientifically supported principles that you can use with any presentation design program or situation. In this comprehensive workshop, youll learn a wealth of simple, practical skills that you, your colleagues, and staff can begin implementing right away. A special formula, Art + Science + Story = Impact!  a kind of “secret sauce” for presentation design — will help you stand out magnificently from the masses! How to make your presentation remarkable by starting off your design with a needs assessment. How to use the artistic and multimedia principles to polish your slides for any purpose or venue. When to incorporate a set of story principles to produce the most powerful impression overall. How to apply three additional tips for creating impact during delivery. 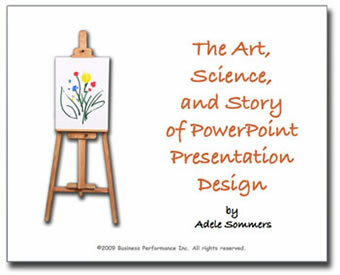 Schedule a Presentation Design “Quick-Start Clinic” Today!